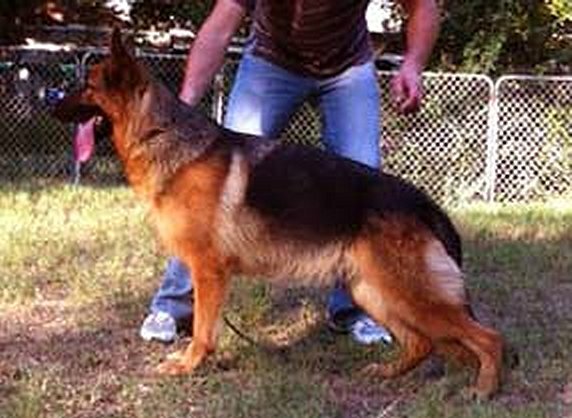 100% German Bloodlines - Breeding to a higher standard! 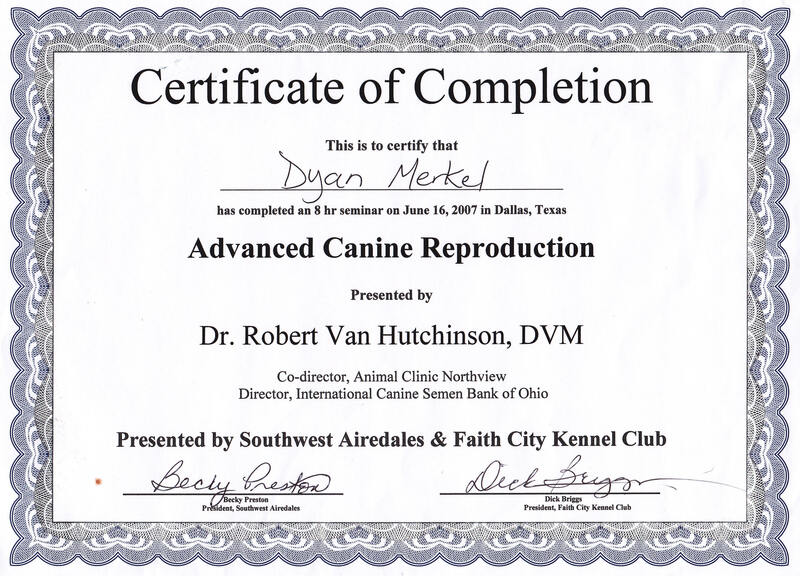 We train/work/title and live with our dogs as well as health test. 2x WORLD SIEGER VA1 YASKO VOM FARBENSPIEL SchH3, Kkl 1a have lived in our house and are in our dogs pedigrees. 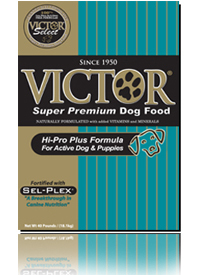 We also have been health testing our dogs for over 40 years! 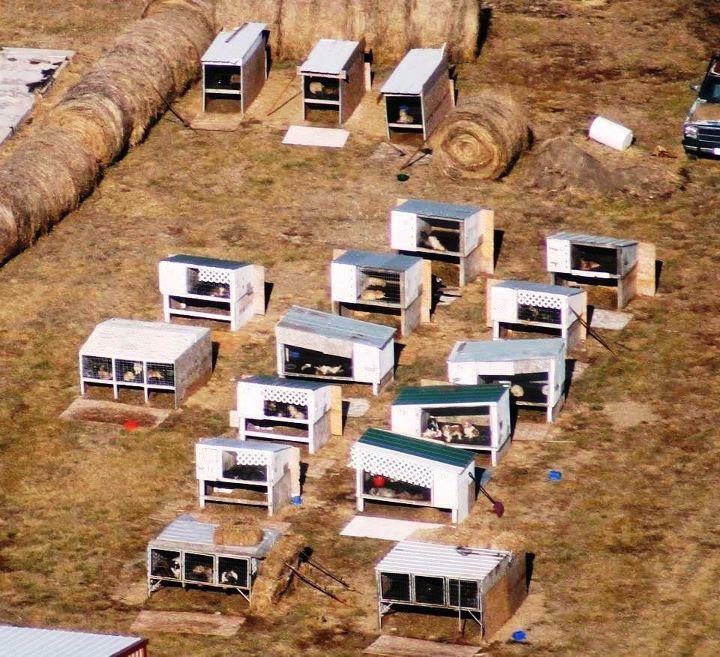 Remember a backyard breeder wants to make a sale. 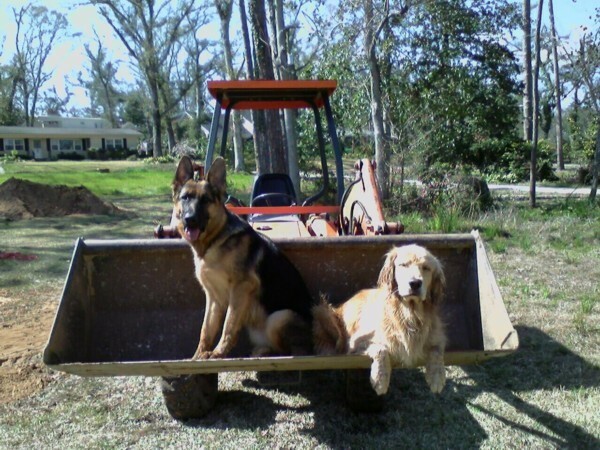 A legitimate breeder wants to make the right sale resulting in LOVING indoor FOREVER home. These facts separate us from other breeders and is what makes us real breeders v.s. buyer breeders! We have known the ancestors personally and therefore have genetic control through selective breeding for all the right things such as health, hardiness, trainability, temperament, the ability to work for man in societal service jobs. Our dogs have good social skills to make them tops as companions for individuals and families with children as well as assistance dogs or dogs for sport, agility, herding or therapy dogs, etc! 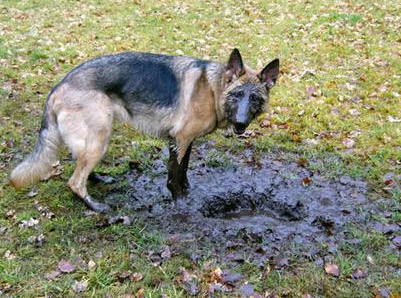 "I would like to interject here my observation of something that continually amazes me, and it has to do particularly with our present-day German Shepherd Dog breeders. Practically none of them have evolved a “plan” of ANY sort. 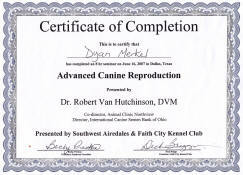 There is presently a heterogeneous crop of imported males available and they are being used as breeders by hundreds of fanciers who have NO knowledge of those dogs’ ancestors. Neither have they the least knowledge of the producing abilities of these studs themselves, in most instances. 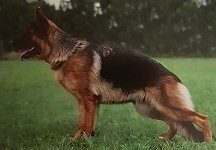 I have asked dozens of these breeders (they cannot rightly be designated as “fanciers”), “Where do you plan to go from there?” and I cannot remember a single instance when any one of them could tell me of a breeding plan he had for the future" An excerpt from the father of German Shepherds in America, Lloyd Brackett. 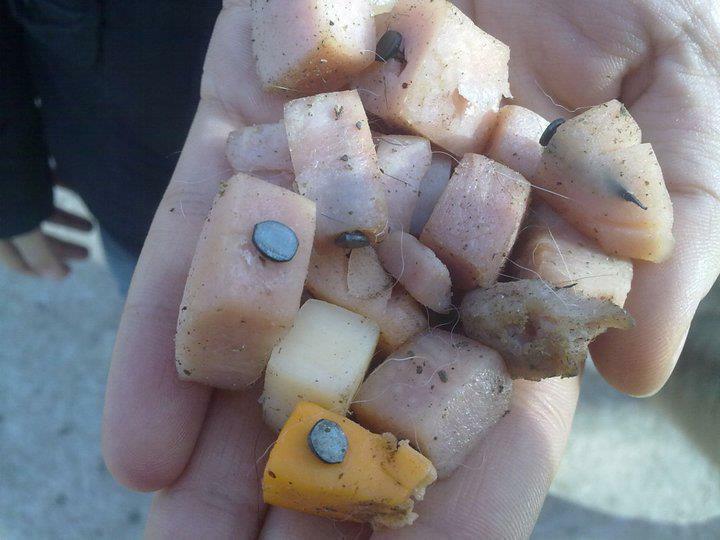 what real breeders are producing below! This is a progeny group...all these males above are from different mothers sired by one top stud dog. 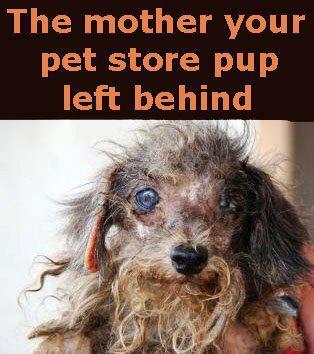 There is a remarkable difference comparing the poorly bred dogs to well bred dogs isn't there! Consistent West German Breed Type! Robust, Athletic & Healthy! 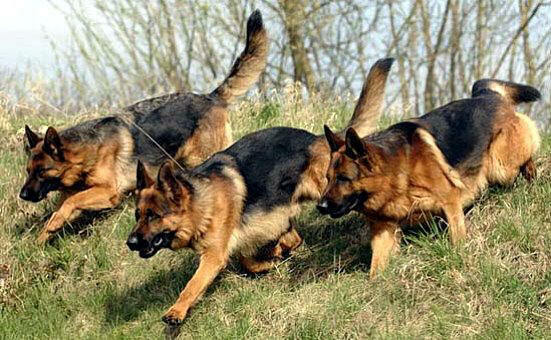 The IDEAL powerful trot of the German Shepherd breed! 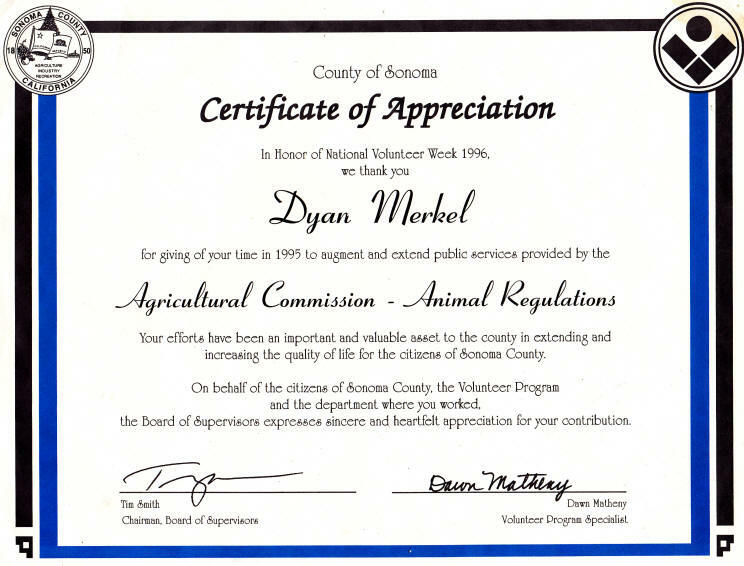 FYI: Price doesn't have anything to do with AKC papers. AKC is a registration company that verifies that the ancestors have been registered in their corporation from the first imported German Shepherds registered here in the United States back in the early 1900's. 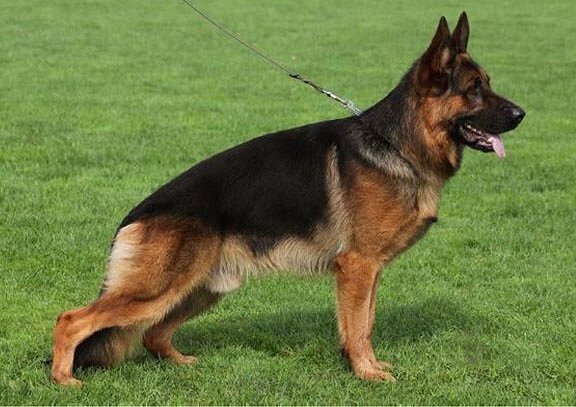 Do not confuse AKC with quality German Shepherds, the quality is produced by knowledgeable breeders that also AKC register their dogs and compete in shows. 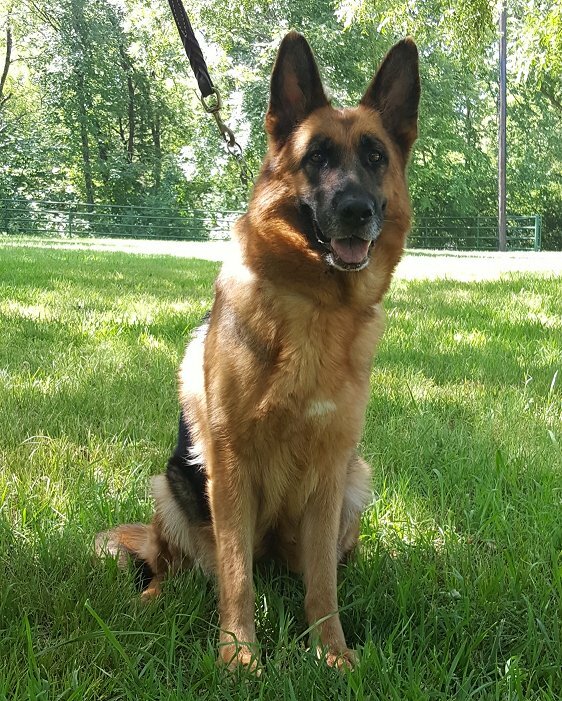 Our pricing has everything to do with, Hip/Elbow Certifications, titles of training and proven breed worthiness, including all the health testing for Degenerative Myopathy, Thyroid, Cardiac, Knee subluxation (laxity can help cause torn ACL's) etc. In top import pedigrees all dogs in the entire pedigree (parents included) since 1960 have been certified free of hip dysplasia. 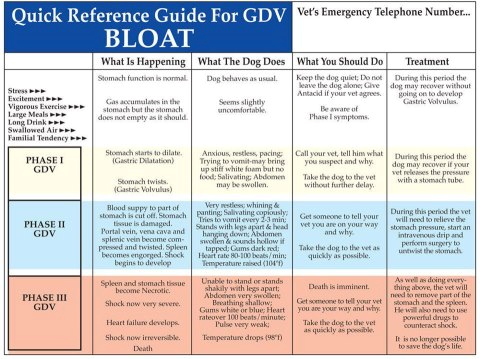 We are dedicated to controlling bloodlines to avoid Gastric Torsion, arthritis, bad temperament, rotten teeth, cancers, Epilepsy and bad temperament. Being a reputable breeder means that one does all the above and spend lots of money to accomplish this. Excellent facilities, hands on 24/7 means the dogs from haus Merkel have all their needs met, emotionally and physically. So even with $2500 puppies knowledgeable breeders that breed to this higher level (breeders like us represent 5% of breeders in the world, very sad commentary on German Shepherds today) dig into their pockets to pay the overage of expenses to get you the best puppies. I would rather see people who buy those less quality dogs thus supporting unknowledgeable backyard or commercial breeders to take their money to rescue and save a life versus support someone who doesn't do right by the breed. nor any negative physical reprimanding. 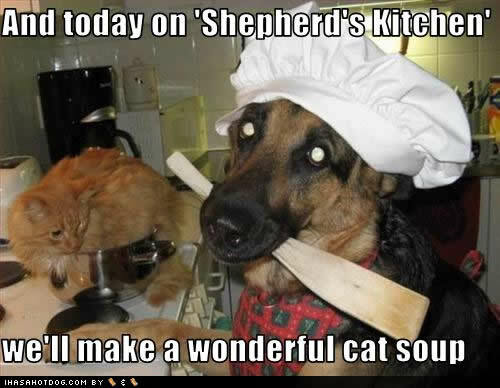 These are well adjusted happy, loving puppies with a bright future. "THERE IS NOTHING COMMON ABOUT A WELL BRED GERMAN SHEPHERD"
One of the best daughters of VA1(SER,MK,HR) Tyson Fixfrutta !!! This wonderful male is crate trained, house trained and has good house manners. His temperament and eagerness to please is the best. 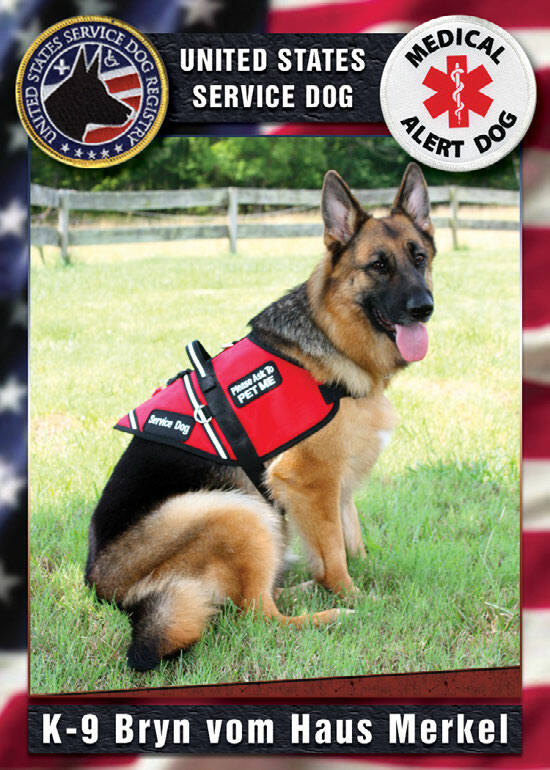 His mothers sister is a Medical Alert/handicap assistant dog and his half sister is one of the best Search and rescue Cadaver dogs around. 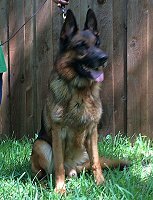 This boy has the potential to be the best companion for a family or a super working dog for someone who has that interest. All of our puppies are large boned red and black with dark eyes. Parents health tested/free by lineage. Puppies have top trainability, superb temperament for family companions (including small children) and security. 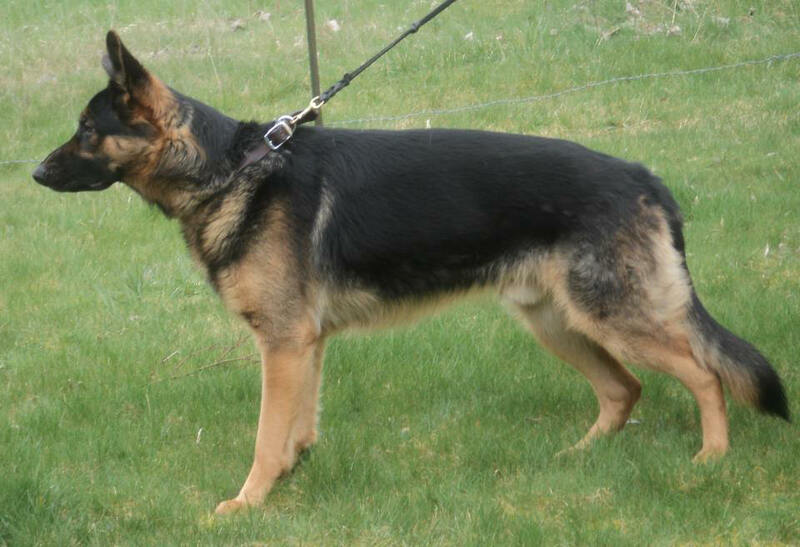 Top Show Potential/Breeding potential/Schutzhund potential. *Prices are subject to change to reflect the amount of training the puppy has for it's age. 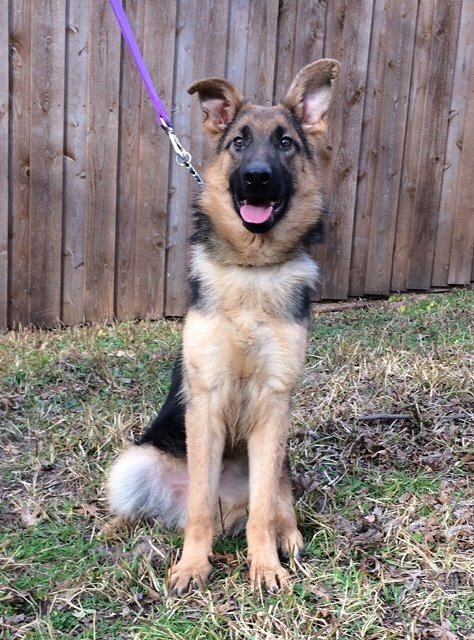 As breeders we are influencing the future of German Shepherds today by breeding the best health tested and temperament tested German Shepherds in our breeding program. This produces the best dogs for the best owners and includes every outstanding element of the canine human bond as our focus; consistency of type, temperament, trainability, health, intelligence and behavioral soundness. 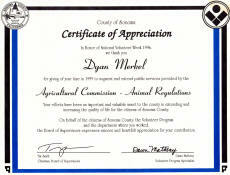 We continue to offer knowledgeable support for the lifetime of your dog. This is what we build our reputation on! 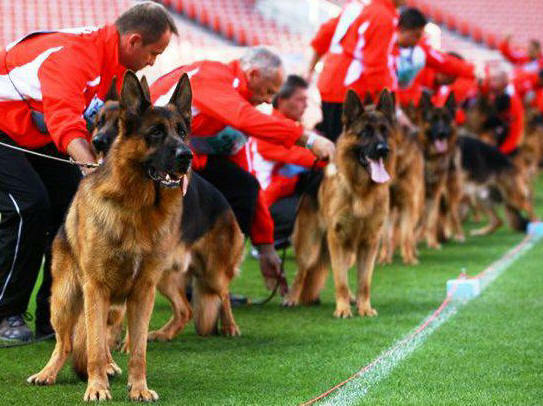 We love our dogs and are aware of the great sacrifice they make by being in a breeding program. As breeding dogs with full hormones they have a greater chance of cancer of the reproductive organs, ruptured uterous', mastitis and pyometra etc. Therefore they will be spayed/neutered once retired from breeding. These wonderful dogs are our family. 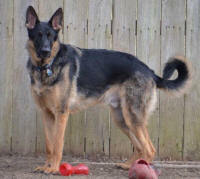 We are proud to offer these outstanding bloodlines in the puppies of these superb dogs to you & your family. Generally we not only have the parents on premise but in some cases some grandparents & Great Grand parent too. Most of our imports go back 5 generations that we bred/own or owned. Dogs we sought out and purchased as the best ones on our trips to Germany. Our foundation female passed at 15 years of age and her daughter, our matriarch is approaching 14 years of age. 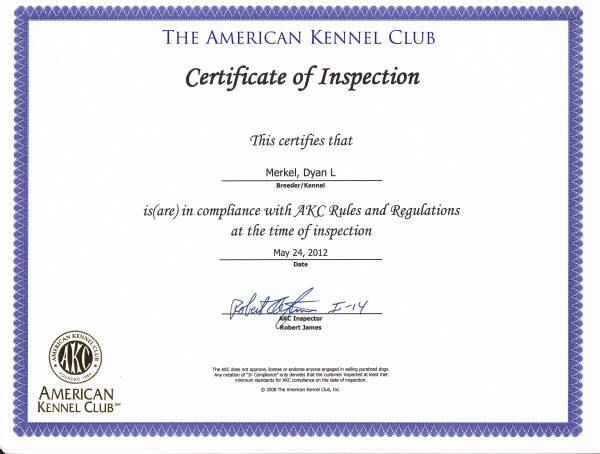 We are also a true certified BREEDER OF MERIT by the AKC. 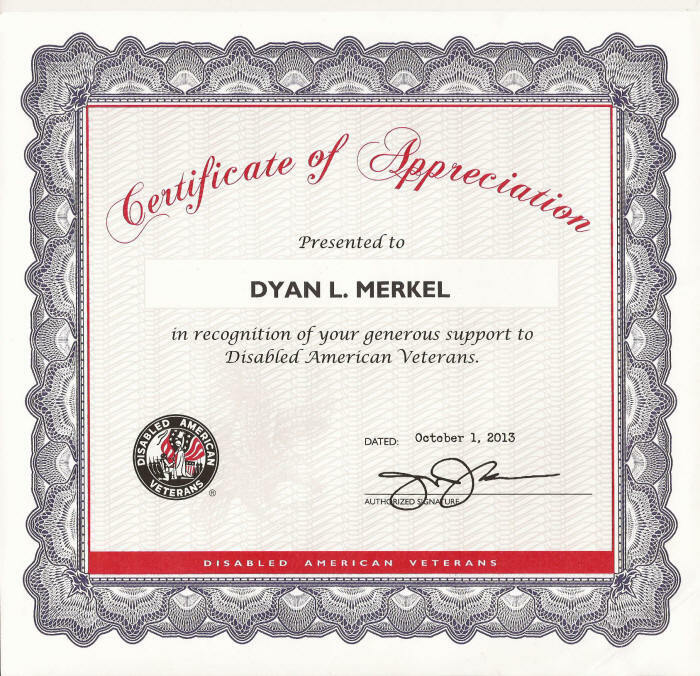 Very few have attained this in the United States. 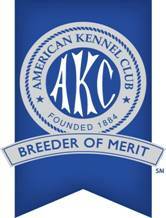 We are very proud of our status as a top Breeder of Merit. Many breeders have this advertising on their site but are not. 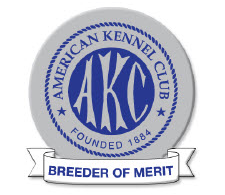 You must check with AKC to verify their 'Breeder of Merit Status'. Daily exercise can only be what the puppy wants to do, not what you want. Growth plates do not close until after 1 year so exercise must be at a minimum or you could permanently injure your growing puppy. We will give you information about what exercise is appropriate for your puppy as well as what stages they go through and how they respond to training during puppyhood into adulthood. 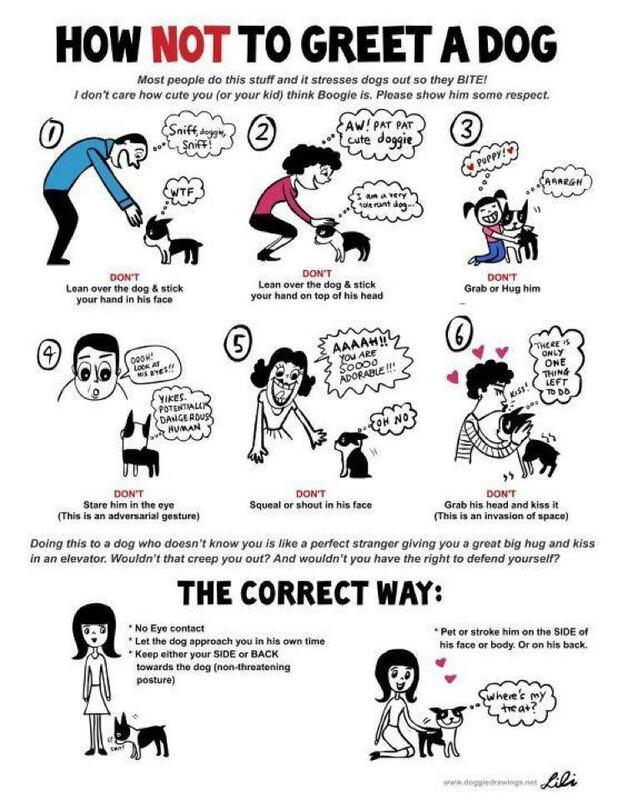 We do not encourage dogs to play hard with other dogs during this growth stage. Nor do we encourage jumping and running for tennis balls or frisbees longer than 5 minutes and further than 25 feet. If injured the dog could end up with permanent injuries of the joints and longbones. 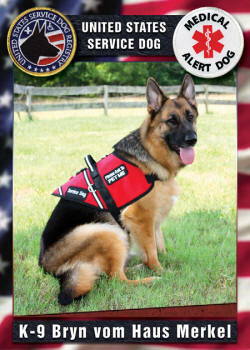 These dogs are bred to be family companions, *Service dogs, Emotional Support Dogs, Guide dogs, medical alert dogs, working SAR dogs, Cadaver dogs, show dogs as well as couch potatoes! We are proud of all our dogs that are in our home and your home. A Breeder ( with a capital B) is one who thirsts for knowledge and never really knows it all. One who wrestles with decisions of conscience, convenience, and commitment. +A Breeder is one who sacrifices personal interests, finances, time, friendships, fancy furniture, and deep pile carpeting! She gives up dreams of a long, luxurious cruise in favor of turning that all important show into this years "vacation". +A Breeder goes without sleep (but never without coffee!) in hours spent planning a breeding. Or watching anxiously over the birth process, and afterwards, over every little sneeze, wiggle, or cry. +A Breeder skips dinner parties because that litter is due or the babies have to be fed at 8.She disregards birth fluids and puts mouth to mouth to save a gasping newborn, literally blowing life into a tiny, helpless creature that may be the culmination of a lifetime of dreams. +A Breeders lap is a marvelous place where generations of proud and noble champions once snoozed. +A Breeders hands are strong and firm and often soiled, but ever so gentle and sensitive to thrusts of a puppy's wet nose. 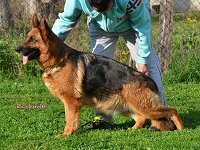 +A Breeders back and knees are usually arthritic from stooping, bending, and sitting in the birthing box, but are strong enough to enable the Breeder to show the next choice pup to Championship. +A Breeders shoulders are stooped and often heaped with the abuse of competitors, but they are wide enough to support the weight of a thousand defeats and frustrations. +A Breeders arms are always able to wield a mop, support an armful of puppies, or lend a helping hand to a newcomer. 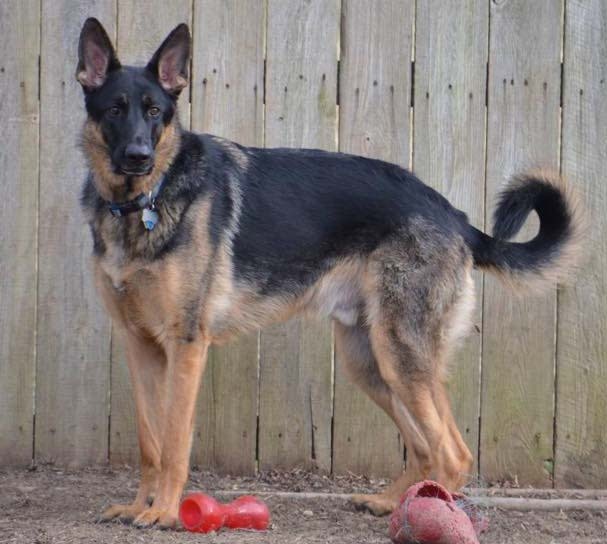 +A Breeders ears are wondrous things, sometimes red ( from being talked about) or strangely shaped (from being pressed against a phone receiver) often deaf to criticism, yet always fine tuned to the whimper of a sick puppy. 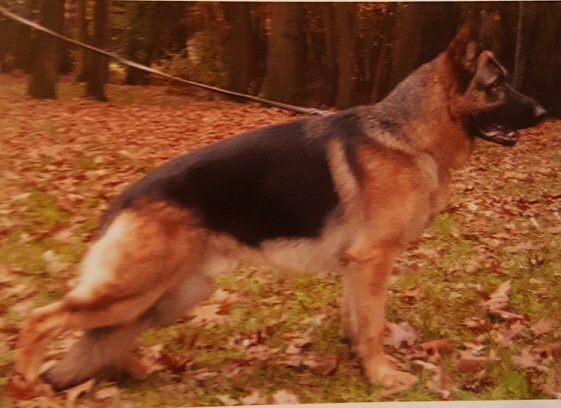 +A Breeders eyes are often blurred from pedigree research and sometimes blind to her own dogs faults, and are always searching for the perfect specimen. 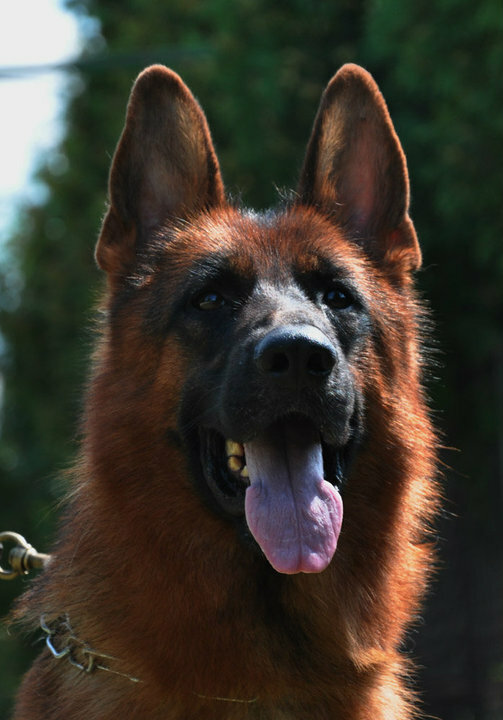 +A Breeders brain is foggy on faces, but can recall a pedigree faster than an IBM computer. It's so full of knowledge and can sometimes blow a fuse: It catalogs thousands of good GENETICS such as perfect ears, heads, sound temperament, outstanding train ability, Intelligence, strong nerves, excellent health with longevity and beautiful harmonious anatomy...and buries in the soul the failures and the ones that didn't turn out. +A Breeders heart is often broken with each beloved generation held in their arms that passes over the Rainbow bridge, but it beats strongly with hope everlasting for the next....and it's always in the right place! Oh yes, there are breeders, and then, there are BREEDERS!